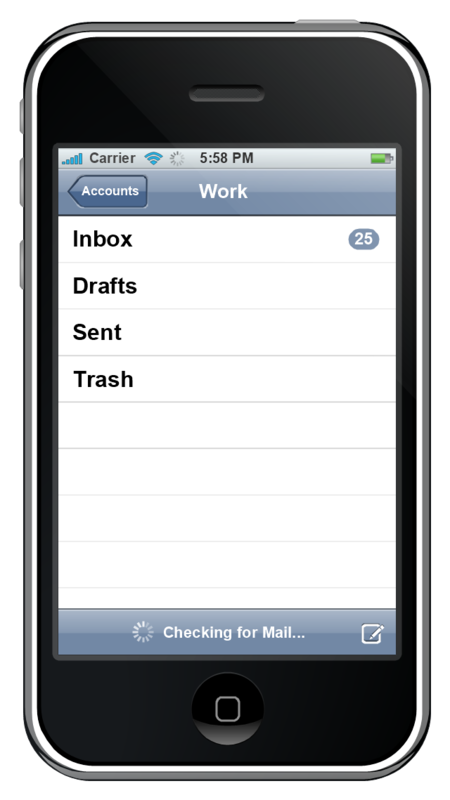 The interface is based around the home screen, a graphical list of available applications. iPhone applications normally run one at a time. 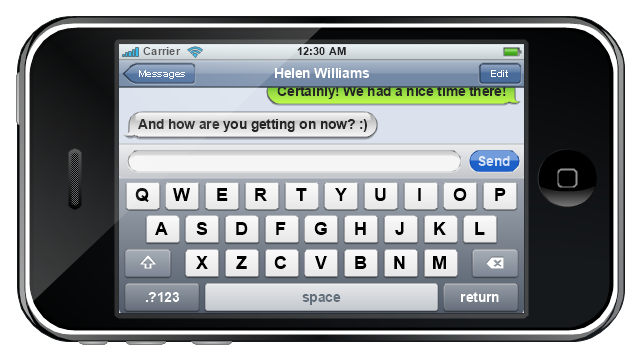 Starting with the iPhone 4, a primitive version of multitasking came into play. Users could double click the home button to select recently opened. However, the apps never ran in the background. Starting with iOS 7, though, apps can truly multitask, and each open application runs in the background when not in use, although most functionality is still available when making a call or listening to music. 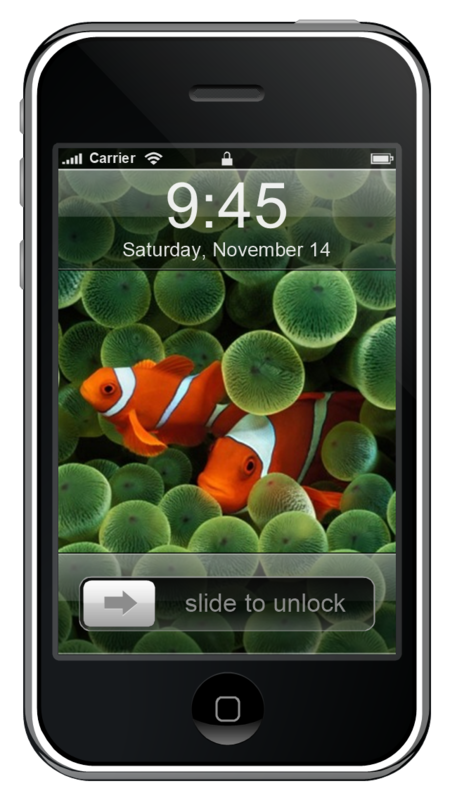 The home screen can be accessed at any time by a hardware button below the screen, closing the open application in the process. (1) The clock face can incorporate multiple round analogue clocks with moving hands or multiple digital clocks with numeric readouts, with each clock being labelled with the name of a major city or time zone in the world. 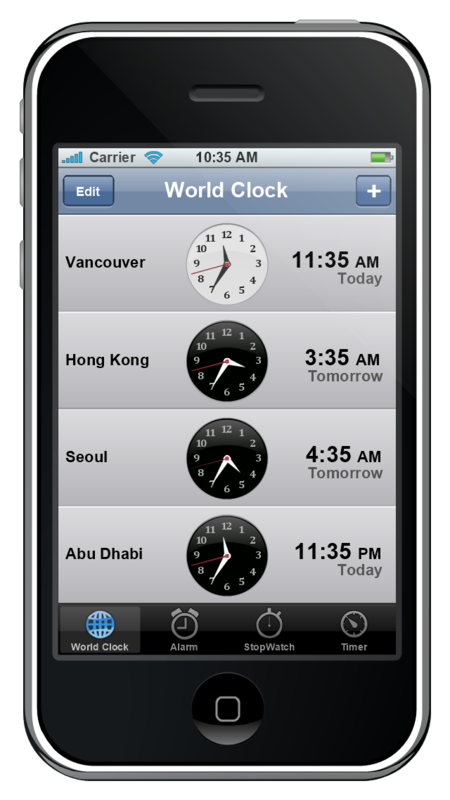 (2) It could also be a picture map of the world with embedded analog or digital time-displays. (3) A moving circular map of the world, rotating inside a stationary 24 hour dial ring. Alternatively, the disc can be stationary and the ring moving. (4) Light projection onto a map representing daytime, used in the Geochron, a brand of a particular form or world edvin. "Smaller mobile devices such as PDAs and smartphones typically use the WIMP elements with different unifying metaphors, due to constraints in space and available input devices. Applications for which WIMP is not well suited may use newer interaction techniques, collectively named as post-WIMP user interfaces. However WIMP interfaces are not optimal for working with complex tasks such as computer-aided design, working on large amounts of data simultaneously, or interactive games. WIMPs are usually pixel-hungry, so given limited screen real estate they can distract attention from the task at hand. Thus, custom interfaces can better encapsulate workspaces, actions, and objects for specific complex tasks. Applications for which WIMP is not well suited include those requiring continuous input signals, showing 3D models, or simply portraying an interaction for which there is no defined standard widget. 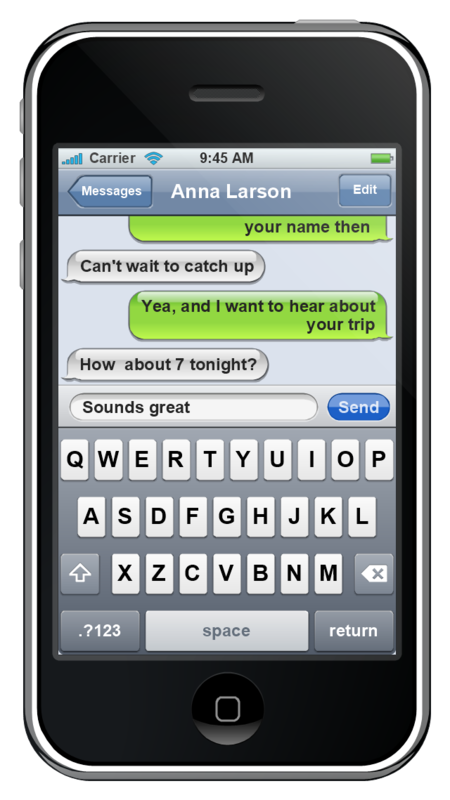 "For text input, the iPhone implements a virtual keyboard on the touchscreen. It has automatic spell checking and correction, predictive word capabilities, and a dynamic dictionary that learns new words. The keyboard can predict what word the user is typing and complete it, and correct for the accidental pressing of keys near the presumed desired key. The vector stencils library "Apps icons" contains 24 icons of iOS 8 / iPhone 6 applications: Messages, Calendar, Photos, Camera, Weather, Clock, Maps, Videos, Notes, Reminders, Stocks, Game Center, Newsstand, iTunes Store, App Store, iBooks, Health, Passbook, Settings, Phone, Mail, Music, Safari. Use it to design iOS 8 apps GUI prototypes and iPhone 6 applications user interface sketches and mockups. "iOS 8 is the eighth major release of the iOS mobile operating system designed by Apple Inc. as the successor to iOS 7. It was announced at the company's Worldwide Developers Conference (WWDC) 2014 on June 2, 2014 and will be released on September 17, 2014. 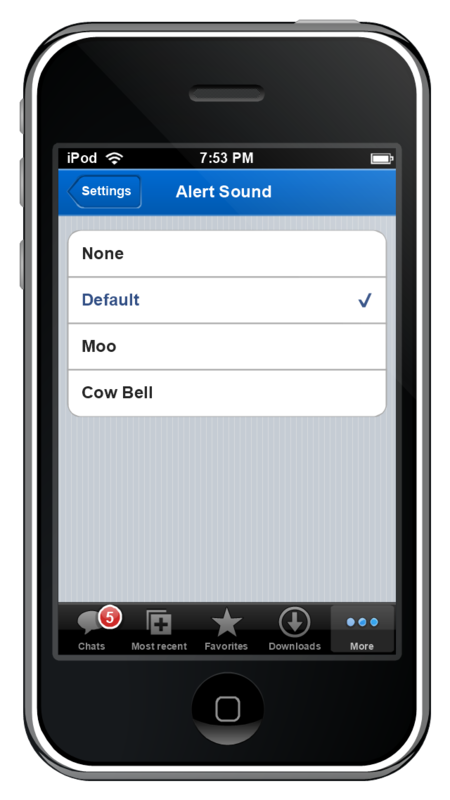 The vector stencils library "Temporary Views" contains 8 iOS apps GUI temporary view elements: alert two-button, alert, action sheet background, action sheet buttons, cancel button, delete button. Use the library "Temporary Views" to add temporary view elements into your sketches, mockups and prototypes of iPhone software applications user interface. 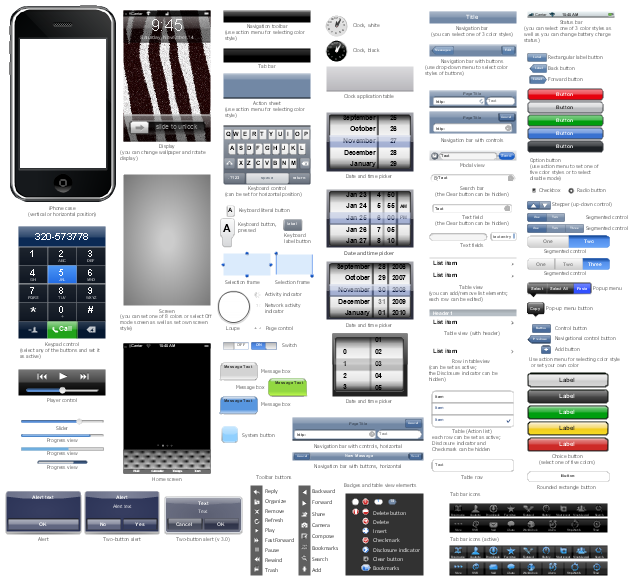 The vector stencils library "iPhone interface" contains 119 design elements for development of graphic user interface (GUI) for iPhone software applications. The vector stencils library "Tab Bar Icons" contains 18 iOS apps GUI elements - tab bar icons: bookmark, contacts, downloads, favorites, featured, history, more, most recent, most viewed, recents, search, top rated, near me, top charts, keypad, voicemail, radio, artists. Use the library "Tab Bar Icons" to draw tab bar elements for design of iPhone software applications user interface sketches, mockups and prototypes.